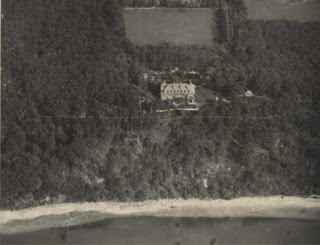 An aerial of 'Burrwood', the Walter Jennings estate designed by Carrere & Hastings c. 1899 in Cold Spring Harbor. Click HERE for more on 'Burrwood' (be sure to scroll past today's post). Photo from the Aiglon Archives. Off topic, when I took a tour of Inisfada a few weeks back, the Father giving the tour mentioned something about the gold coasts "Irish Row", that stretched from I.U. Willets in Albertson (I assume the Clark Botanical Gardens mansion), to Sands Point. Does anyone know about this and the families that made up that row? John D Ryan would have also been part of "Irish Channel". Mackay was not as Harbor Hill was considerably East.